The master plan write-up of Seri Tanjung Pinang is a large and complex undertaking involving all aspects of design from marina engineering and environment to urban design and architecture. Successful and diverse cities are created by many kinds of collaborating developers, designers, engineers and many other talented people who can draw upon their global skills to create a robust framework for development over the next quarter of a century. E&O have assembled this team of leading and award winning consultants who have the necessary international and local experience to create such a framework. Seri Tanjung Pinang will be on the global stage and set a benchmark for developments of such scale in the future. CCCC(M) is a wholly-owned Malaysian subsidiary of China Communications Construction Company Limited (CCCC) and was incorporated to principally undertake the reclamation of STP2. The infrastructure giant has established its track record in Malaysia with the design and construction of the 24-kilometre Sultan Abdul Halim Muadzam Shah Bridge (Penang Second Bridge), Malaysia’s longest bridge. The company has also executed a host of large-scale reclamation projects which include the Hong Kong New Airport Platform Project and the Macao International Airport. Dato’ Ir. Dr. Nik Mohd Kamel is the founder and Managing Director of Dr. Nik & Associates Sdn. Bhd. – an engineering and project management consultancy firm. Dato’ Dr. Nik had initially started Dr. Nik & Associates as a sole proprietor in 1993 and later in 1994 the company has been incorporated as Dr Nik & Associates Sdn. Bhd. From 1993 onwards, he has directed and also provided technical advice and input for all water resources and coastal engineering projects undertaken by DNA. These covered detailed designs of flood mitigation, river modelling, hydrological analysis, urban drainage design, water resources management, environmental impact assessment, coastal engineering design and modelling, dredging and land reclamations projects. The company’s clients over the years include government and semi-government agencies like the Department of Irrigation and Drainage, Public Works Department, Iskandar Regional Development Authority (IRDA) and Penang Port; and corporations like Petronas, Malakoff, E&O, UEM Construction and Siemens KWU. Dato’ Dr. Nik obtained his B.Sc. (Hons) in Civil Engineering from the University of Southampton, United Kingdom in 1979. He continued his studies and obtained a Master’s Degree in Water Resources Engineering from the same University before completing the Ph.D program at the Institute of Science and Technology, University of Manchester, United Kingdom, in the field of Hydraulics Engineering in 1985. Dato’ Dr Nik had started his working life in academia, rising to later become an Associate Professor at the Civil Engineering Department of the University of Malaya (UM). He was also the Referee for the Institute of Engineers Malaysia’s (IEM) Journal and Bulletin from 1987 to 1991, and the Director of UM’s Unit Perundingan in 1992. After 14 years of involvement in the academic side of engineering, Dato’ Dr. Nik decided to venture out and apply the skills and knowledge he had learned and taught to the practical world of engineering. He has undertaken numerous feasibility studies, design studies and successfully managed coastal engineering projects in Malaysia and Middle-East such as in Oman and UAE. 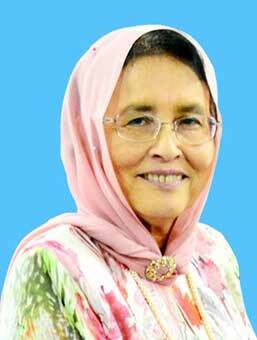 Professor Dato’ Dr. Sharifah Mastura Syed Abdullah has served in various administrative positions at Universiti Kebangsaan Malaysia, namely as Director of the Bureau of Consultancy and Innovation, Chairperson of the School of Social, Development and Environmental Studies, and the Dean of the Faculty of Social Sciences and Humanities. Currently, she is the Director of the Institute of Climate Change, the Chairperson of the Climate Change Niche, and Chair Holder of UKM-YSD Climate Change. True to her area of expertise, which is in the fields of Hydro-Geomorphology, Remote Sensing Application and Geographic Information System, Professor Sharifah Mastura diligently works her way through and is now a leading researcher in various projects related to the environment. These projects include the Shoreline Management Plan for IRDA, the Nusajaya Green Plan for UEM-Land, the West Johor Integrated Shoreline Management Plan for DID, the Sand Piper Ramsar Project for Khazanah, and the Comprehensive Nature and Resources Plan for Iskandar Malaysia. Professor Sharifah Mastura has also undertaken the task of coordinating three research programmes, i.e. the trans-boundaries issue in Selat Johor, and Long Term Research Grant Scheme on Climate Change and Trans Disciplinary Research Grant Scheme on Sea Level Rise. She is also an environmental consultant that has produced many DEIA and Guidelines for IRDA, DOE, DID and JPBD. Her steadfastness as an academic and researcher has resulted in Professor Sharifah Mastura being appointed as a technical expert to the Government of Malaysia at the International Tribunal of the Law of the Sea (ITLOS) on 25-27 September 2003 in Hamburg, Germany. This is with regards to the Case No. 12 titled ‘Case concerning land reclamation by Singapore in and around the Straits of Johor (Malaysia vs. Singapore)’. Related to this, Professor Sharifah Mastura also represented the Malaysian Government in the Malaysia-Singapore Joint Committee on Environment (MSJCE), and she is the technical advisor to the Committee Meeting on Malaysia-Singapore Marine Port Authority and Johor Port Authority (MPA-JPA). Professor Sharifah Mastura also was a technical expert to the Government of Malaysia pertaining to the Batu Putih 2007 Oral Proceeding at the International Court of Justice. This is with regards to the ‘Case concerning sovereignty over Pedra Branca/Pulau Batu Putih, Middle Rock and South Ledge (Malaysia-Singapore). Professor Sharifah Mastura is a recipient of Langkawi Award in October 2014. This is the most prestigious award for her contribution towards environment in Malaysia. She was conferred the Johan Mangku Negara (JMN) by the Yang di Pertuan Agong in 2009 and Darjah Dato’ Paduka Negeri Sembilan (DPNS) by Yang di-Pertuan Besar Negeri Sembilan. She was also awarded as a Profesor Kelestarian Alam Sekitar Wan Fatimah. For the record, Professor Sharifah Mastura has written 80 academic articles and 100 books, produced 80 proceedings, and supervised more than 100 Masters and PhD students. BuroHappold Engineering is an internationally renowned multi-disciplinary engineering consultancy with a global network of offices. BuroHappold’s services range from the large scale infrastructure masterplanning of new cities through to the engineering design of iconic buildings and public spaces. Creativity and sustainability are put at the forefront of all BuroHappold design solutions. BuroHappold has played a leading role in the design and delivery of many world famous developments, such as the 2012 Olympic Park in London. In 2012, BuroHappold was awarded the best engineering consultancy award by the Association of Consulting Engineers in the UK. For the past two years, BuroHappold has been closely involved in the planned development of Seri Tanjung Pinang Phase 2. In 2012, BuroHappold provided technical support to the masterplanning architect for Seri Tanjung Pinang Phase 2 through the provision of a full range of engineering consultancy services. In addition, BuroHappold prepared the Environmental Sustainability, Transport and Infrastructure strategies for the masterplan. During the past few months, BuroHappold has undertaken detailed “third party” reviews of the Hydraulic Study and Environmental Impact Assessments prepared by Malaysian engineering consultancies Dr. Nik & Associates Sdn Bhd, led by Professor Dato’ Dr. Sharifah Mastura Syed Abdullah. The aim of these reviews was to validate that the studies are technically robust and fit for purpose when compared against relevant standards and methods of best practices.